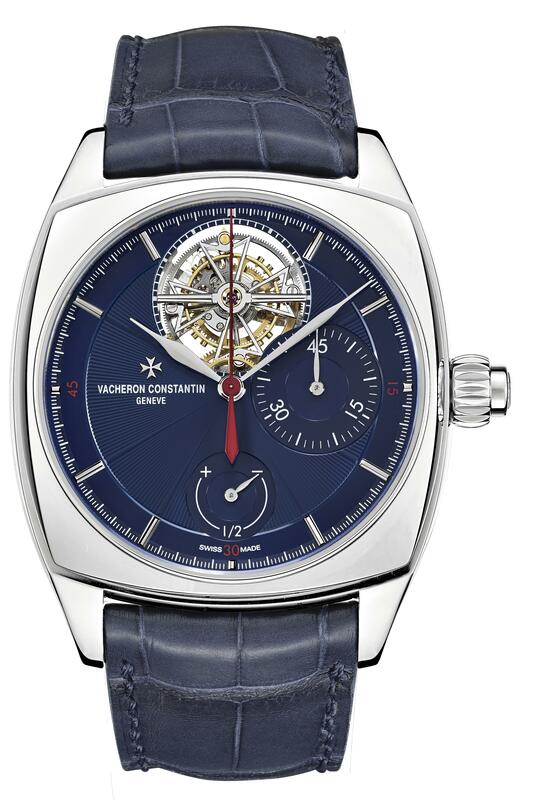 With so much emphasis today on the fact that many collectors are looking for bespoke watches, it comes as no surprise that one of the world’s most esteemed watch brands, Vacheron Constantin, would go out of its way to deliver on that demand. Just recently, and running for another week or so, Vacheron Constantin is bringing 20 newly unveiled one-of-a-kind Les Cabinotiers watches on tour across America. It is an opportunity to see, touch and possibly buy a truly unique timepiece. Last week on my PerfectTiming column on Forbes, I wrote extensively about the collection, the tour and several of the watches, now I bring that article here. “Nearly 265 years old and continually operated, the venerable Swiss watch brand of Vacheron Constantin is a benchmark in the industry. A leader in innovation and craftsmanship, the brand regularly turns out not only production watches for every day wear, but also some of the most alluring and enticing bespoke, one-of-a-kind watches. Called the Les Cabinotiers collection, these unique and exclusive watches are the object of desire for many a collector. Now, Vacheron Constantin unveils 20 new Les Cabinotiers, which are taking a United States tour beginning tonight in Beverly Hills, CA. This marks the first time the brand has taken the Les Cabinotiers pieces on a tour such as this, which goes from Beverly Hills to Orange County, then to Miami and ends in New York. Among the 20 unique Les Cabinotier watches making their US debut are pieces that represent the brand’s incredible technical complications such as minute repeaters and tourbillons, as well as its savoir-faire in the artistic crafts of enamel, engraving and marquetry work. From perpetual calendar watches to tourbillons and more, the new collection is born of the mastermind watchmakers and artists at Vacheron Constantin who yearn to see their dream come to life. Named after the 18th century Cabinotiers who were Geneva’s most experienced watchmakers, the collection consists of some of the most precious watches Vacheron Constantin turns out. 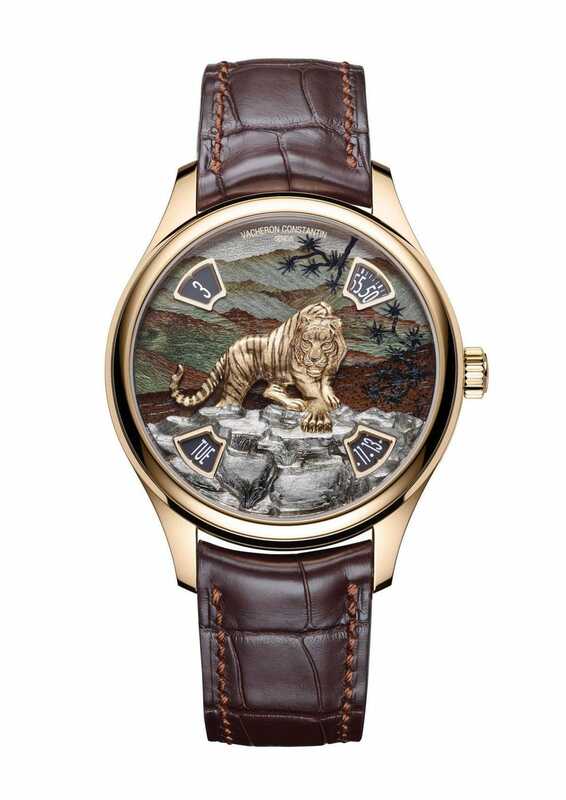 Highlights include the hands-free Imperial Tiger watch with a green/gray wood marquetry dial with a realistic sculpted tiger poised atop a rock ready to lunge. The tiger sits full center on the dial and at 10:00, 2:00, 4:00 and 8:00 on the dial are apertures to indicate the date, minutes, hours and respectively. The 41mm 18-karat 5N rose gold watch is powered by the brand’s highly coveted Caliber 2460 G4 that holds the Hallmark of Geneva Seal. 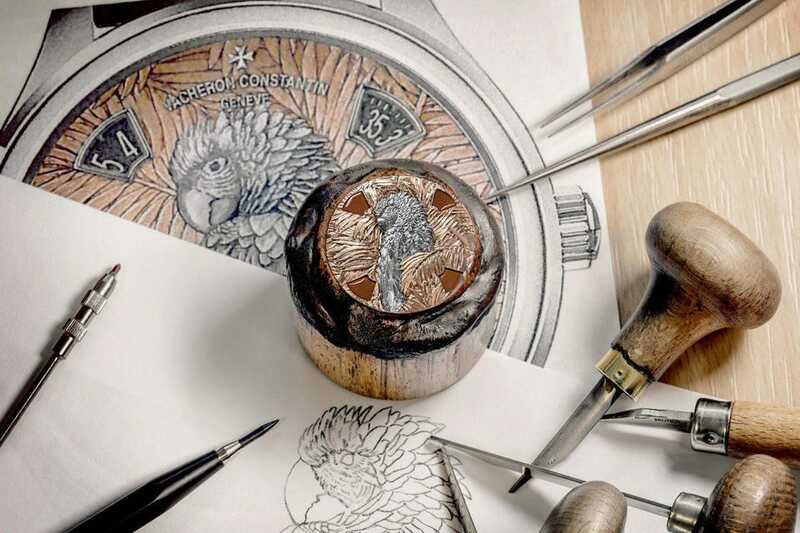 Similarly, the new 40mm Mysterious Animals Parrot watch, crafted in platinum utilizes the same hands-free caliber as the Imperial Tiger but features a dial totally hand engraved. The main portion of the dial is engraved and sculpted palm leaves in 18-karat yellow gold. 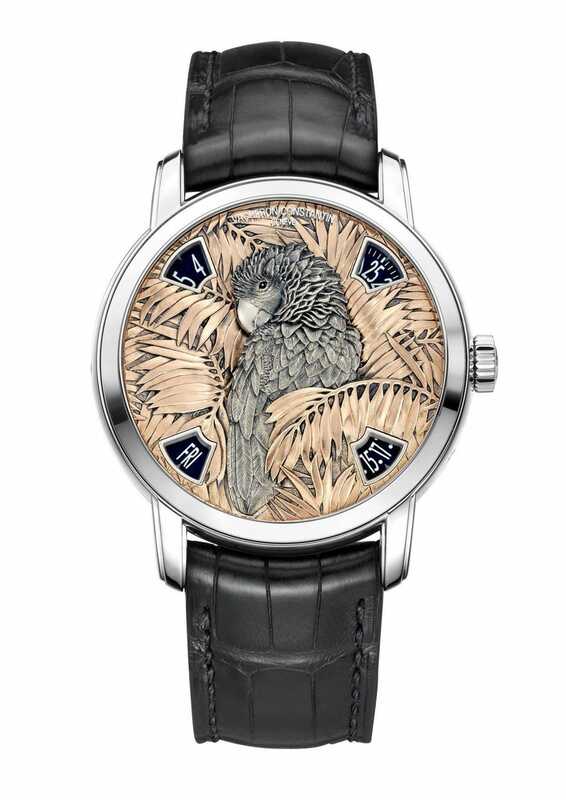 Nestled in the middle of the palms is a meticulously engraved 18-karaht white gold parrot. Deftly blending ultimate mechanics with elegant beauty, Vacheron Constantin also unveils the Minute Repeater Tourbillon Twilight. 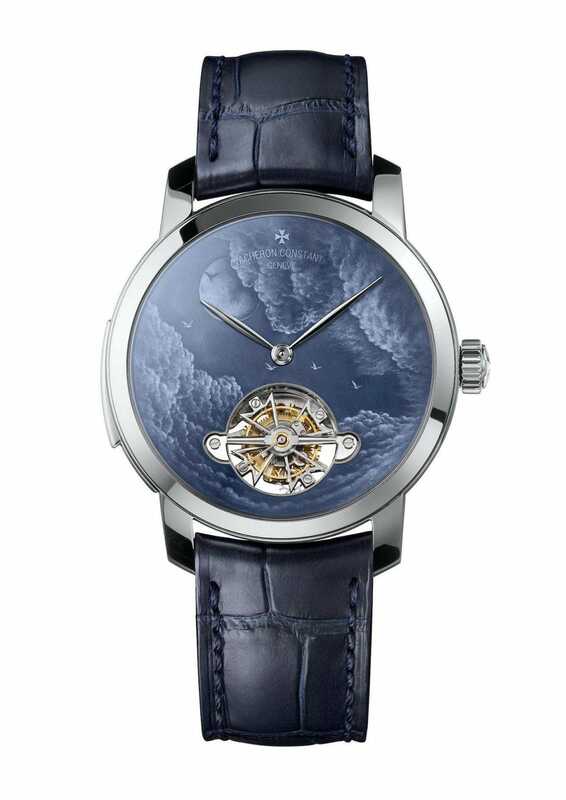 As its name suggests, this watch features a stunning dial depicting the twilight sky with a smoky blue gray with the clouds and birds. The 18-karat gold dial is hand painted with a Grand Feu translucent enamel to achieve the depth and dimensions. The 18-kara white gold case measures 44mm in diameter. The watch is powered by the mechanical caliber 2755 TMR movement that consists of 471 parts and 40 jewels. It offers 58 hours of power reserve. These three examples are just a small sampling of the collection of 20 Les Cabinotier watches making their way across America this week and next week. As mentioned the watches start their tour at the Vacheron Constantin Beverly Hills boutique, (February 6-8), followed by the South Coast Plaza boutique (February 9-12), then will move to the East coast and be available at the Miami Design District boutique starting on February 14, and will end their in the New York boutique from February 20-23. The watches can be seen by appointment only.